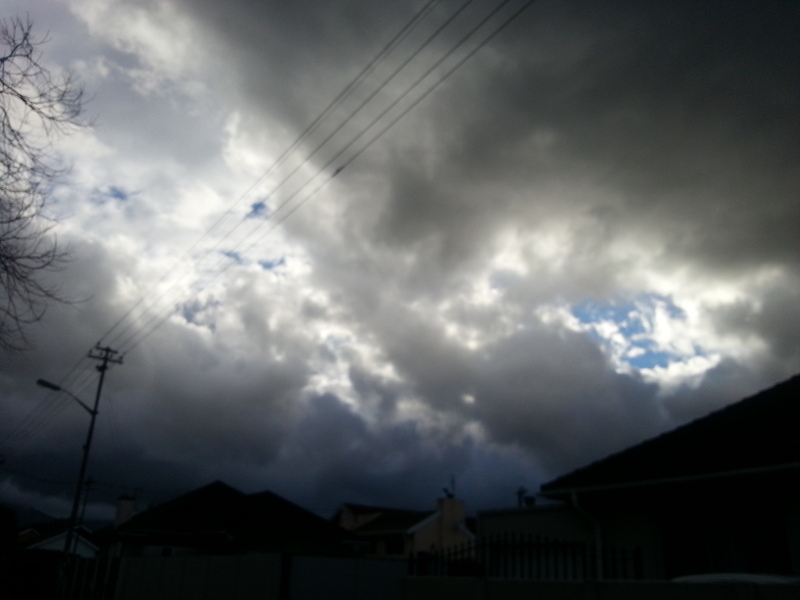 A Cape Town sky full of weather. Think about the town where you currently live: its local customs, traditions, and hangouts, its slang. What would be the strangest thing about this place for a first-time visitor? I live in Cape Town, South Africa, a city on a mountainous peninsula jutting out into some very rough sea. Go south and all you will find is the vast Southern Ocean. The climate is allegedly Mediterranean, and the scenery is beautiful. But the weather is – how to say this kindly? – unpredictable on the granular, daily level. In the round of the year, we have wet and grey winters with howling gales and horizontal rain. In summer we have a wind called the Cape Doctor, a gritty, unpleasant south-easterly. I grew up in more temperate climates further up the coast and was astounded at the ferocity of the weather here when I first came to university. But Capetonians firmly believe they live in a golden paradise (and indeed there are golden, glorious days) and that any weather they are currently enduring a mere oddity that will pass. They huddle in corners away from the wind that blows incessantly for a good ten months of the year and say to each other plaintively: “This is a really cold winter (insert other weather observations here).” They have never learned to adapt their driving to wet roads, appearing to believe that it never actually rains in winter. They arrange braais for summer evenings when they must surely anticipate that the wind will be so strong they will be unable to light the fire. It’s a standing joke in my family, the way I make lists. But really, they work. This is not just shopping lists, though I make those too (in the computer, with all the standard items ordered by aisle in the local supermarket). There are different classes of lists, with different calming powers. Everyday lists – reminding me to do things like renew the library books, or get the deworming tablets. I make these a week in advance (off a rolling master list), so Things Get Done. That old thing about asking a busy person to do things is true – but only because the busy person has taken the trouble to get organised in this way so you don’t have to. 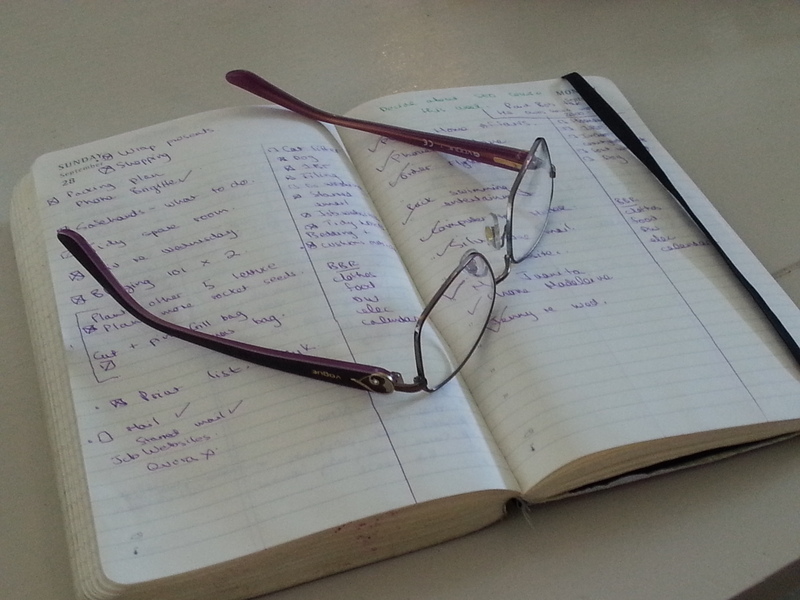 Routine lists – also made in advance, saying things like put clothes out at night, pack lunch. I write them down even though I do them every day. It makes me feel better. Longer-term lists – guess what, they are made in advance. This is things like make mince pies in October and freeze them so I am not running round like a crazy person in December. Big event lists – here is the real power of a list, the preparation for a big event. An exam, a training course I am running, a holiday, a house move, a wedding… all of these are conquered by a list (or many lists). Sitting down with a cup of tea, a black Moleskin diary and a preparedness to think things through can instantly reduce that feeling that things have become too complicated, too overwhelming, toooooo much. Panic subsides. I move through the list, one item at a time. I’m still nervous and still worried and still anxious, but I have a plan. And as every South African knows, making a plan is everything. You are so organised, say all my friends. I’d say to them, it is just the lists but I know they don’t believe me. So I smile and say thank you. You’ve been given the opportunity to send one message to one person you wouldn’t normally have access to (for example: the President. Kim Kardashian. A coffee grower in Ethiopia). Who’s the person you choose, and what’s the message? Lawal Toyyib Abiola on I am the proud recipient of a Google Africa / Udacity scholarship #GoogleUdacityScholars #ALCwithGoogle @googleafrica.